At Amano, we not only contribute to society through our business activities, we are also active in developing various social activities as a corporate citizen in order to realize a better society. 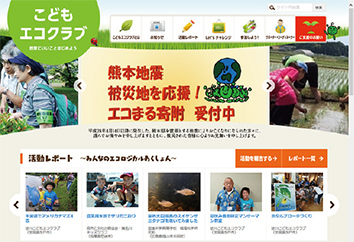 Japan Environment Association (JEA) offices across Japan provide programs and opportunities for the environmental activities conducted by the Kids' Eco Club with the support and cooperation of local communities, companies, and organizations. As Amano is engaged in businesses related to both time and the environment, we support the Kids' Eco Club project as a project partner. The project is aimed at promoting children's environmental conservation activities and their environmental education, encouraging children to be friendly to the environment and helping children to develop the ability to think for themselves in acting to resolve environmental problems. It is also intended to expand the local network for environmental conservation activities. To prevent illegal dumping in the Tsukui area, local residents, local companies, related organizations, and the local government are working together to conduct the "Campaign for Eliminating Illegal Dumping in Tsukui". The aim of this campaign is to publicize the need to eliminate illegal dumping in the area and to collect litter and illegally dumped waste. 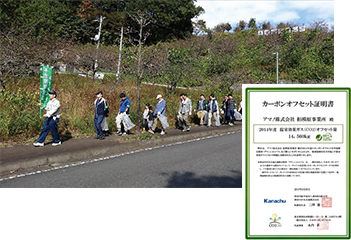 Volunteers recruited from among employees working at the Sagamihara Factory take an active part in this campaign each year. In addition, the factory also engages in the "Green fund-raising campaign" and a program for the use of "Commuting passes with carbon offset certification". 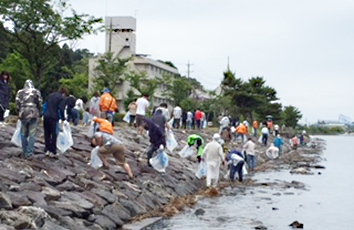 To protect Lake Hamana—an invaluable natural environmental resource that represents Hamamatsu City—local residents work together to clean the lakeshore areas on the first Sunday of every June. The Lake Hamana Clean-up Campaign is sponsored by the Lake Hamana Clean Water Association, an organization established by local governments (Hamamatsu City, Kosei City, and Shizuoka Prefecture), chambers of commerce and industry, tourist associations, and companies in the areas surrounding Lake Hamana. Volunteers from the Hosoe Factory take an active part in this campaign each year.